Erythema is a reddening of the skin caused by the enlargement of the superficial blood vessels or inflammation. It arises from different reasons: due to strong emotional states, allergies, overheating. It can also be a sign of disease states. It takes many forms – from regular, in the form of spots with clearly marked edges to a rather irregular forms. There are several kinds of erythema. Blushes cannot be underestimated, especially those which remain on the skin longer or appear suddenly for no reason. It can cause discomfort. In any case of erythema please consult a doctor to determine the cause and the introduction of treatment. You usually continue the treatment by yourself using properly selected cosmetics which solidify the effects of the treatment. 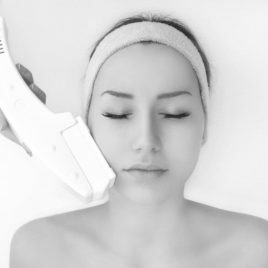 Treatment for blood vessels with the use of Harmony laser is characterized by high efficiency. Laser beam energy penetrates into the skin and closes dilated capillaries. At the same time stimulates the production of collagen, which is responsible for skin firmness. 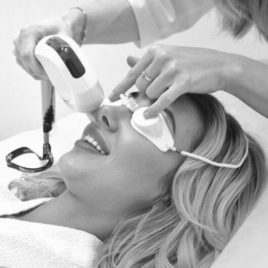 By the use of laser the blood vessels are coagulated and permanently closed. The treatment is accompanied by contact cooling which ensures complete safety of the treatment and increases patient’s comfort.